This study is a fresh and original attempt to liberate the theory of criticism from the limitations of connoisseurship, and the assumptions of aesthetics from the difficulties and paradoxes of aesthetic relativism. It presents a picture of what rationality in the assessment of the arts would be like if one were expected to justify one's decisions in and about the arts.Kadish focuses upon the way in which competent and reasonable people express their differences, not upon the way they instruct novices. Among good critics, the author proposes, differences are not managed as differences concerning matters of taste, nor would anyone presume otherwise were it not for a prior and gratuitous choice of a context of consumption for considering the arts. 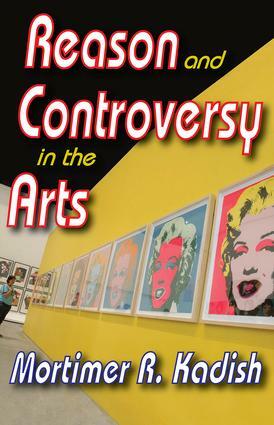 The author examines the hypothesis that differences of opinion in artistically relevant controversy are in a fundamental sense practical, that when critics of the arts differ seriously, proposals for the proper conduct of the arts and a procedure for interpretation of the arts are what is at issue.To understand the special logic of controversy in the arts Kadish compares that controversy with legally relevant and scientifically relevant controversies. Finally, the arts and criticism are found to be parts of a coherent enterprise the criteria of which are generated in an evolving practice, as are the criteria of law. This illuminating discourse is of continuing relevance to those interested in aesthetics.